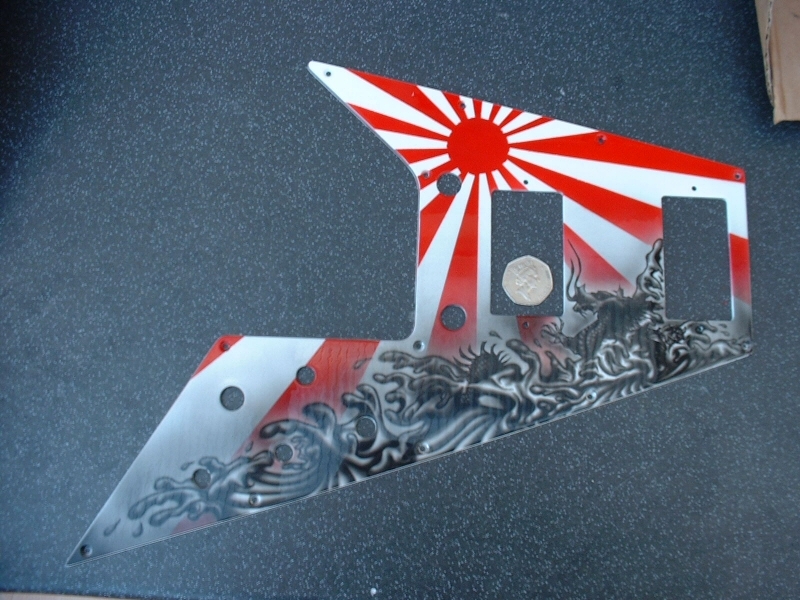 Want your computer case, guitar, toilet seat airbrushed!? I won't do an exact clone of any of the items you see but happy to do do something very similar with subtle colour/layout/detail changes. Trying to keep each item as one-off where possible. 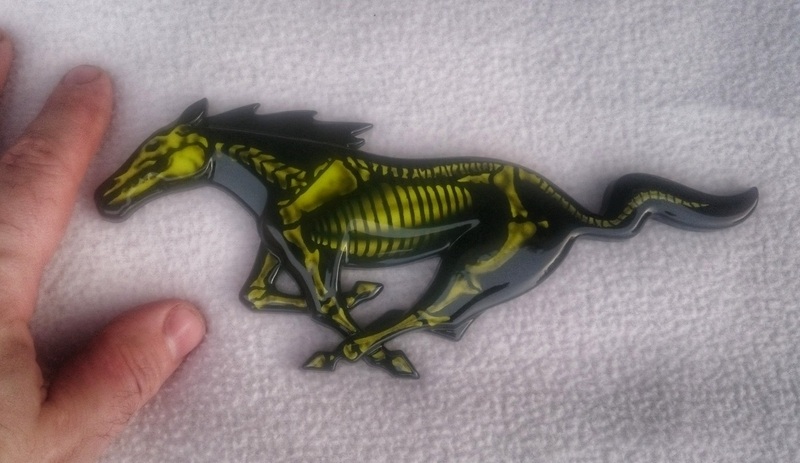 Front grille badge for a yell and black V8 Mustang muscle car. Seat cowl given a new lease of life with some cafe racer esque artwork. Classic Fiat 500 fuel tank came to me in a sorry state after being blasted to get rid of rust, etc. Whole top surface smoothed out with filler and high build primer before rippled flag artwork applied, along with detailed classic fiat chrome logo centrepiece. Fuel cover sprayed with a mural of the actual car it goes on. Lots of tiny detail work. Pen in photo gives an idea of scale. Severly dented and rusty lawn mower fuel tank restored and painted up for a child sized hotrod I am building as a personal project. 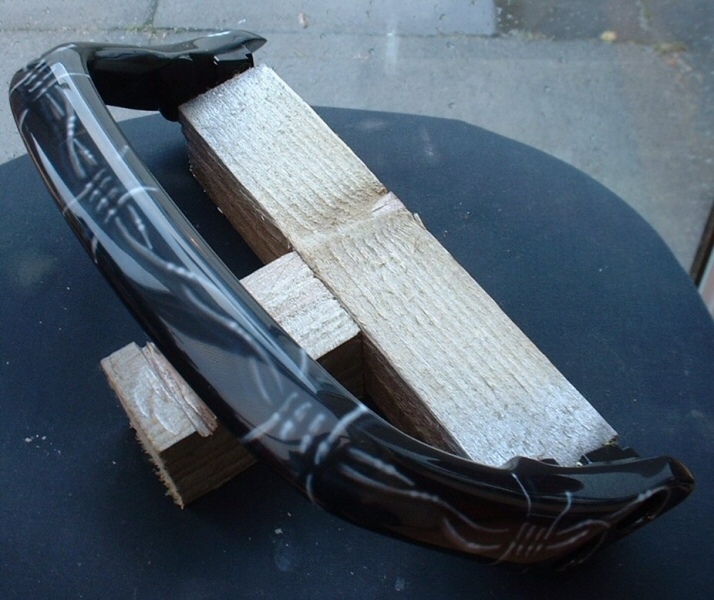 Triumph mudguard came to me with an extention piece added onto the rear edge. All filled and re-profiled for an invisible addition so all looks one piece. Painted in metallic black with an airbrushed Triumph logo with a 3D enamel badge look. Polisher/Sander body airbrushed up in classic GT40 Gulf racing scheme. All the parts sprayed individually for a factory look on assembly. Cowbell horn cover in detailed sheriff badge design. 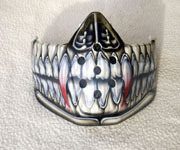 Cowbell horn cover transformed from rusty chrome to detailed skull design. I-phone cover sprayed in an intricate winged skull design. Lots of tiny detail work. Rocker Cover and cam cover, etc sprayed in a Freddy Krueger themed design, with lots of detailing throughout. Very nice. 2 helmet face masks done in skull style. Aged bone and lots of detailing. Large girl in coffin artwork. Approx 1 metre tall on 3-4mm thick aluminium plate. Micro detailing throughout in the lacework, etc. Quite a showstopping piece this one for someones sitting room wall. Something similar spec. - Approx £420.00 GBP. (POA) including metal. Large full size fireplace cover sprayed on sturdy 3mm thick aluminium plate. Gothic themed surround with skull inlays in purple candies, etc. Main mural in centre with extensive candy use and ture fire, etc. 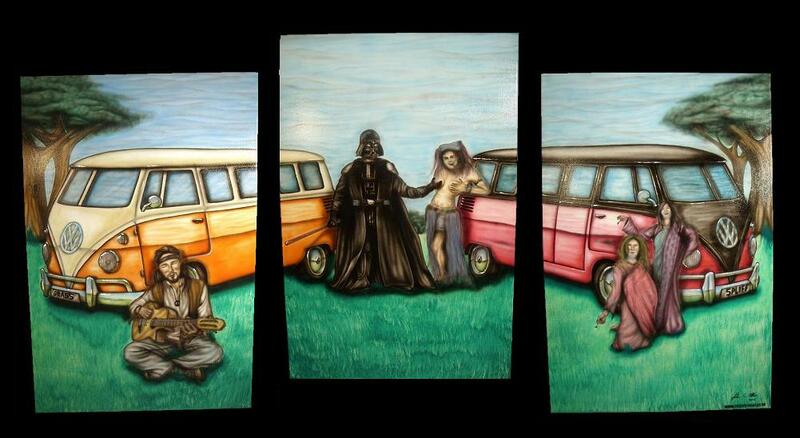 Attention grabbing piece for the sitting room. Something similar spec. - Approx £360.00 GBP. (POA) including metal. Huge 1 metre square cover for a trucks 5th wheel towing hitch when at shows. Painted in a rippled flag effect with some detailed lettering, etc. 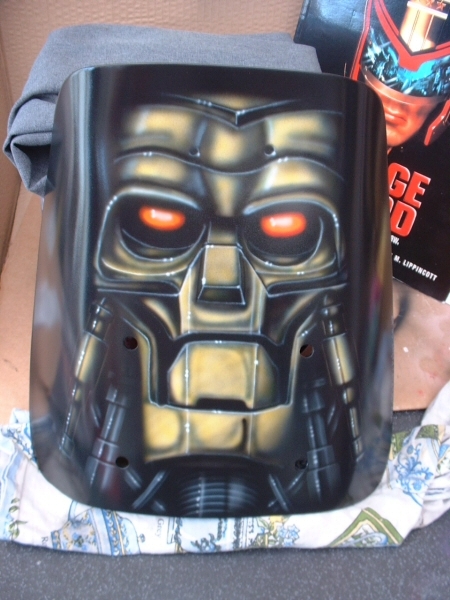 Front section of an open face helmet sprayed up in a vampire skull style. Real carbon fibre fairing screen sprayed up with company logo in the style of the original drawing but with a few artistic flourishes. 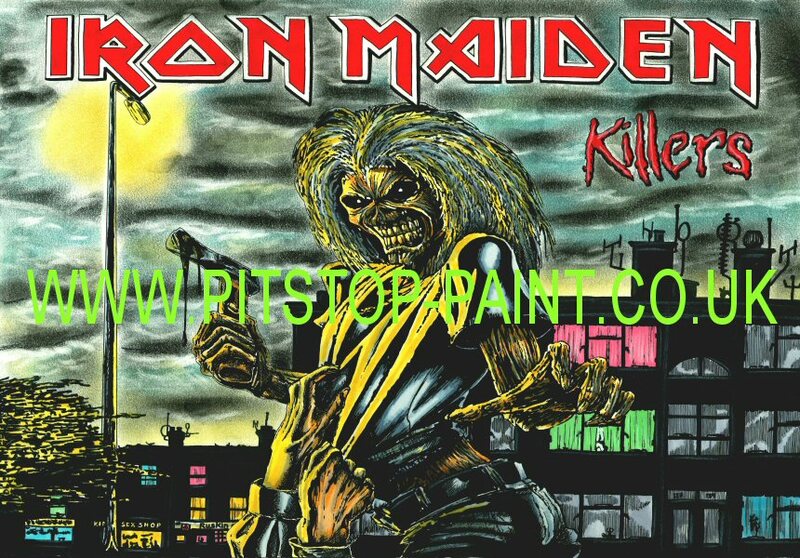 Detailed skull design with green candy colouring to match bikes paintjob. Zombie design with some nice detail work. (3` x 2`) 92cm x 62cm wall canvas done for a customer in mostly B&W with a feint blue candy colour wash. Lot of nice detail close up and a real attention grabbing scale also. 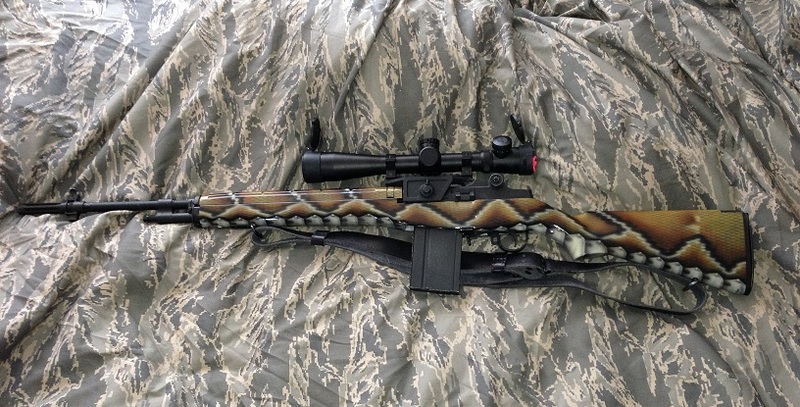 Something similar spec. - Approx £240.00 GBP. (POA) including canvas and delivery. 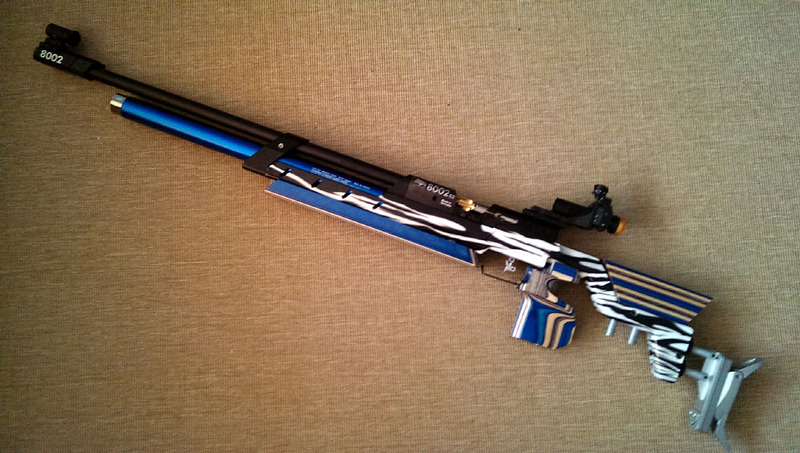 Rifle stock done in zebra print effect. Something unusual to spray with some nice detail work. Bowling pin sprayed for a friend in exchange for him making me some bike parts. Seriously damaged pin repaired and sprayed in metal plate effect with rivets, etc. Overlayed with old school flames with hotrod artwork inlayed in blue candy. Very nice peice of artwork. An old motorcycle clutch basket was polished up and used as a stand for display. 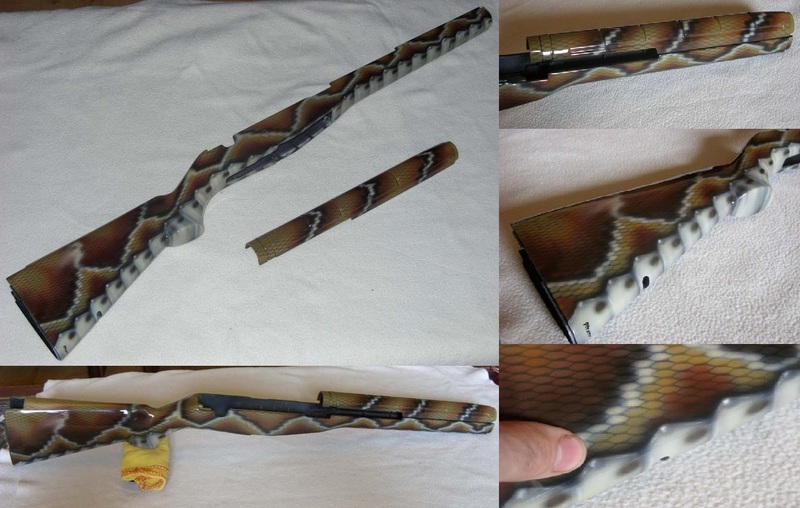 Rifle stock done in snakeskin effect with belly scales, etc Something unusual to spray with some nice detail work. Golf club done to owners design. Detailed small mural and text, etc. Neat and different. Rocker Cover and cam cover, etc sprayed in detailed dragon design and coated in red candy colouring to give a subtle effect. Very nice. Aluminium frame bungs sprayed metallic gold to match other parts on bike. 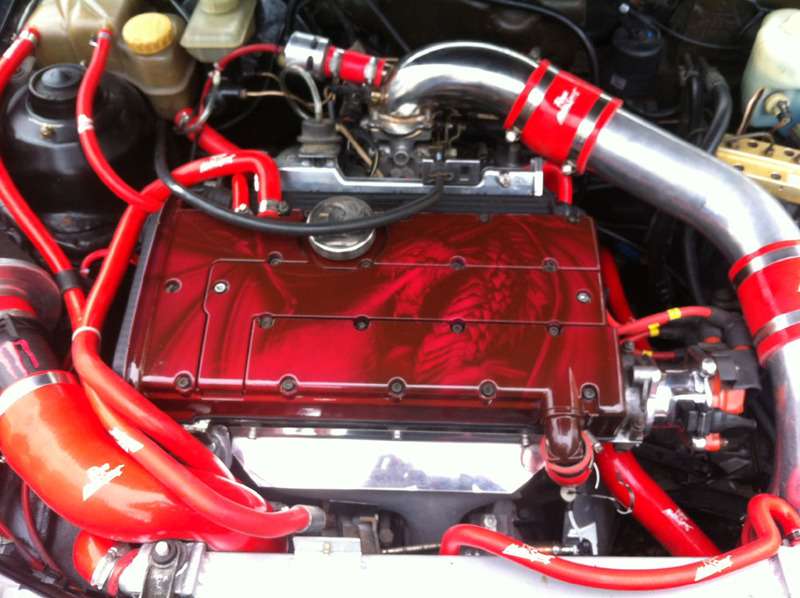 Rocker Cover and cam cover, etc colour match and featuring ghosted flame. Detailed floating text in carbon fibre texturing, etc. Neat. Engine block casings for a project bike. Fully stripped and countless hours spent masking it up prior to spraying. Etch primed for good adhesion, etc. Red colour is exact match for the bike paintwork I did for customer previously. Something similar spec. - Approx £220.00 GBP. (POA) Due to hours involved masking/prep work. I-phone cover sprayed to match customers helmet design. Lots of tiny detail work. Denim cut-off sprayed to match customers bike paintwork I did also. Damaged aluminium frame bung trimmed smooth on lathe and sprayed up to match customers bike featuring some small detail work. Flyscreen for a modern Z1000 done with artwork from Mad Max 2 Movie featuring moonlight version of Lord Humungus with 3D effects, veins, etc, etc. Nice addition to customers bike. Miniature helmet done as a exhibition piece to showcase detail skills. Features very small detail work throughout and even my visor insert mechanism. Set of Ford car engine parts done in blue true fire with subtle background tribalwork and a blue metalflake hue. 2 Murals of bulldogs in an aggressive cartoon style to tie in with owners bulldogs. A nice underbonnet modification and very different to the normal faded/scuffed black plastic. Phone cover done to owners specifications incorporating the relentless drinks logo and a firey background. Bright and eyecatching peice. I- phone cover done in green/yellow true fire with detailed skulls inlayed and few subtle lightning bolts and background texture, etc. Very striking and detailed peice. 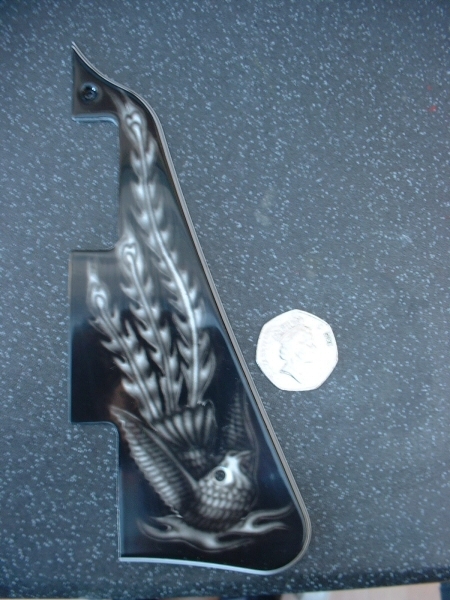 Phone cover done to owners specifications featuring a suzuki GSXR and a chrome effect Suzuki logo, etc. Very Large set of 3 canvas artworks measuring almost 2 metres accross when assembled and hung. Done to owners initial concept and theme, etc. Very large scale but contains some small detail work also throughout. An eyecatching peice of original artwork for the owners wall. Switchgear done in matching style to owners bike paintwork. Simple yet striking updgrade to standard switchgear to really tie things together. includes stripping out internals for spraying, etc. Phone cover done to owners specifications featuring dirty hospital style tiled background with blood splatters. Owners logo and web address in foreground. Very original and detailed peice. I- phone cover done in orange/yellow/red true fire with a detailed skull inlayed and few subtle lightning bolts. Very striking and detailed peice. I- phone covers done to owners specifications. His cover featuring micro detail porsche logo and gulf racing theme to match his cars, and his wifes featuring same blue and theyre sons karting race logo. Special very personal covers ! I-Phone back cover airbrushed to match owners bike colour scheme featuring combat effect anarchy symbol usage in background. Textured racing stripes with drop shadow effect and detailed anarchy symbol amongst other features. Very accurate and neat addition to any pocket. Yantosh`s SV project fuel-cap (as seen in Streetfighters magazine). Detailed company logo featuring micro-detail horizon, bird, etc. Very detailed small work for a subtle overall look. Neat. Scuffed up MTB Marzocchi forks sprayed in green true fire theme to match bike theme. Detailed text with horizon and highlights, etc and some lightning bolts. Very sleek looking. Tired old switchgear transformed along with alloy engine catch-tank to match bike theme. Couple of pics of parts fitted to bike and Streetfighters magazine feature too. Replacing bad visability black visor with one of my own visors and inserts to increase useability in dark/bad weather conditions. Visor matched to original paintwork and insert done to match design. ABC Warrior design from Judge Dread movie. Coloured to match dragbikes bodywork. Very nice! 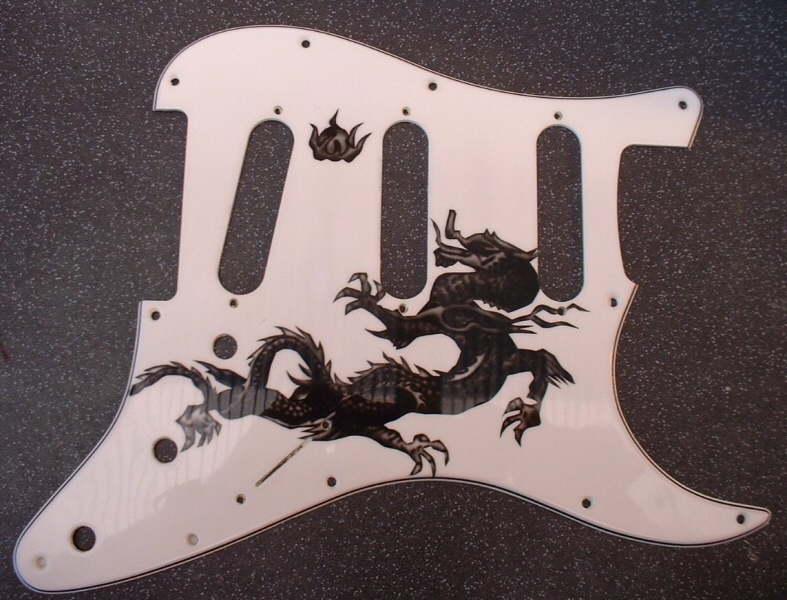 Small scratch-plate with phoenix design. 50 Pence peice gives idea of detail! 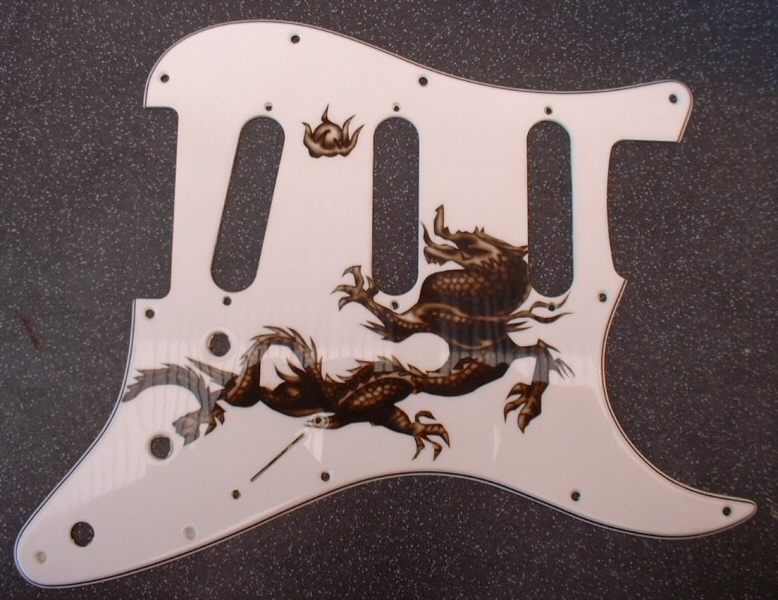 Waterdragon design with sun motif. Ultra high detail which the camera does no justice to. Very nice. 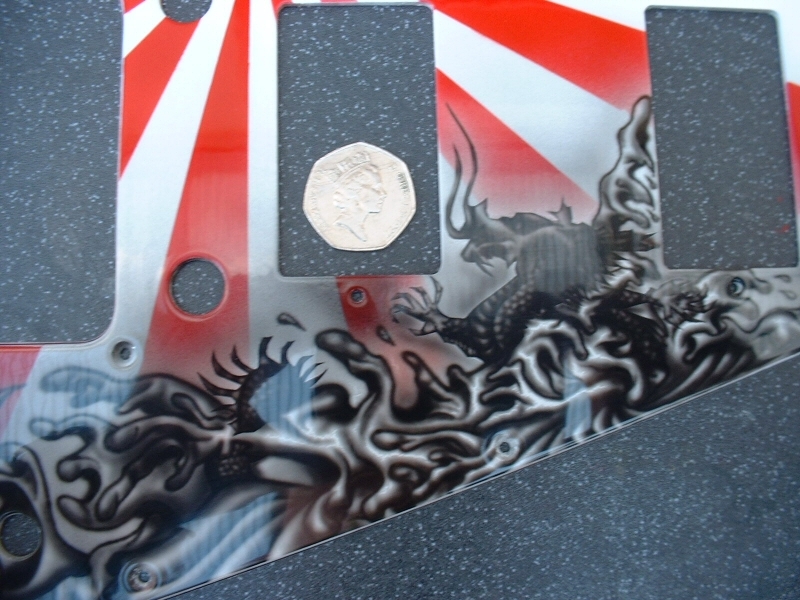 Matched pair of Fender Stratocastor guitar scratch plates. One in black and one in dark brown. Tiny detailing and fully polished. Very neat. 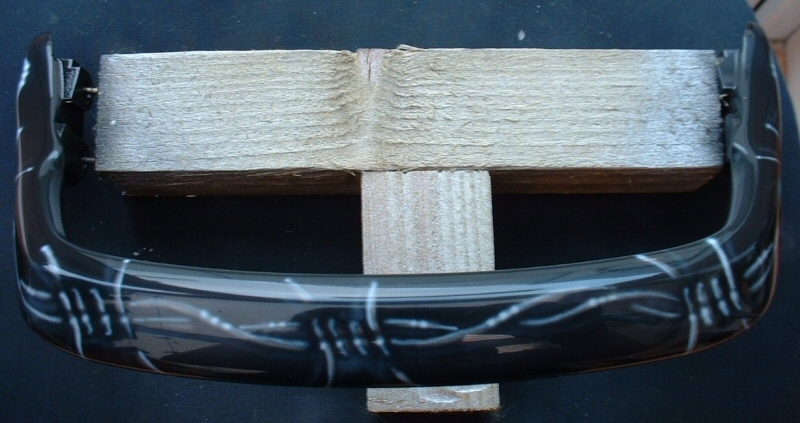 Grabhandle with barbed wire running accross surface. Silver has metallic finish when sun hits it. Subtle drop shadow effect in background, and specular highlights. Very subtle yet very neat. 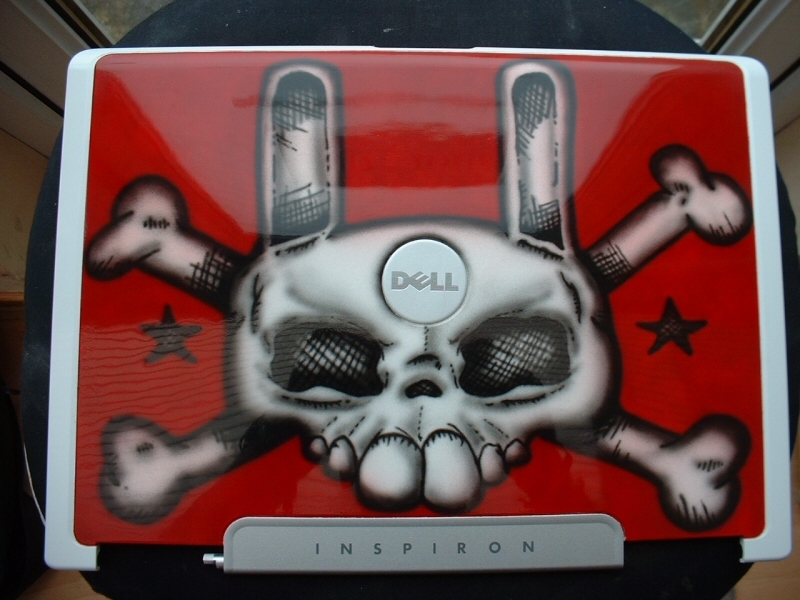 Laptop cover to customers own design of evil bunny. Sprayed in marker pen style. Bold and eyecatching!